The 10mm Auto is a fantastic, high powered round. Developed in 1983, the 10mm Auto is a great option for self defense applications as well as competition shooting. When you hear about Federal, one of the most popular names you hear is American Eagle. 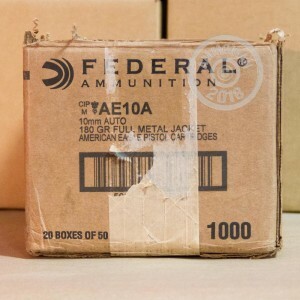 Federal American Eagle rounds contain high quality components, but still have the great price you are always looking for when you buy ammunition. 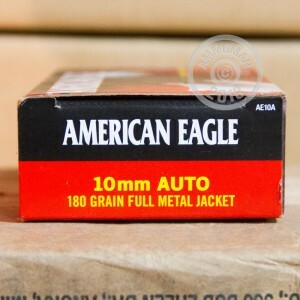 These 180 grain, 10mm Auto, full metal jacket rounds are perfect for high volume range training. 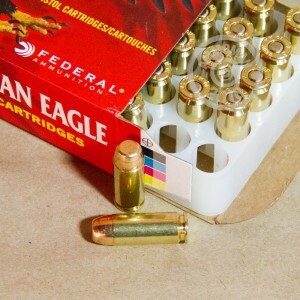 Not only do they feature the high quality and low price of the Federal American Eagle line, but these rounds feature brass casings and boxer primers, ripe for your reloading bench. At AmmoMan.com all orders over $99 will receive free shipping! So stock up and save more!